"replace the butter with margarine"! "I replaced the cocoa powder with chocolate milk mix"
"I substituted chocolate milk mix for the cocoa powder"
This interests me because I want my recipes to be clear and understandable, and I'm trying to improve my own language in the recipes I write. To substitute means to put a person or thing in the place of another; it does not mean to take the place of another. When A is removed and B is put in its place, B is substituted for A and A is replaced by B. "The Minister said he hoped to substitute coarse grain with homegrown barley"
"to substitute home-grown barley for coarse grain"
if in a recipe butter is replaced by margarine, margarine is substituted (is the substitute) for butter. ... To avoid confusion, use replace instead of substitute as a verb. 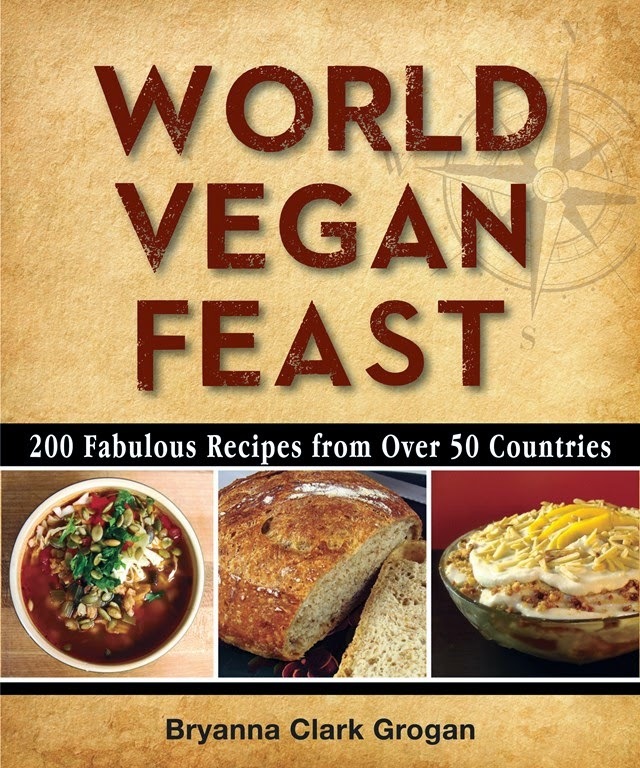 Thanks so much, Gail Davis, for posting this on your "Hungry Vegan" blog! I'm so glad you enjoyed it! RECIPE UPDATED OCTOBER 27, 2018. 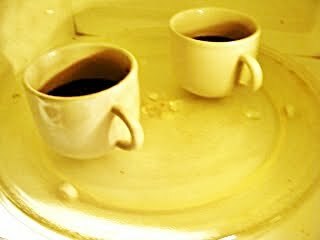 UPDATE, Aug. 26, 2010: Well, last night I tried steaming the mugs as an alternative to using a microwave-- it was a flop, I'm afraid! For one thing, it ended up taking 18 minutes steaming time, which kind of defeats the whole exercise of a 5-minute cake! But, perhaps more importantly, it didn't rise and get fluffy like the original. It was, as the British say, "stodge"-- yuck! Sorry, no solution there. 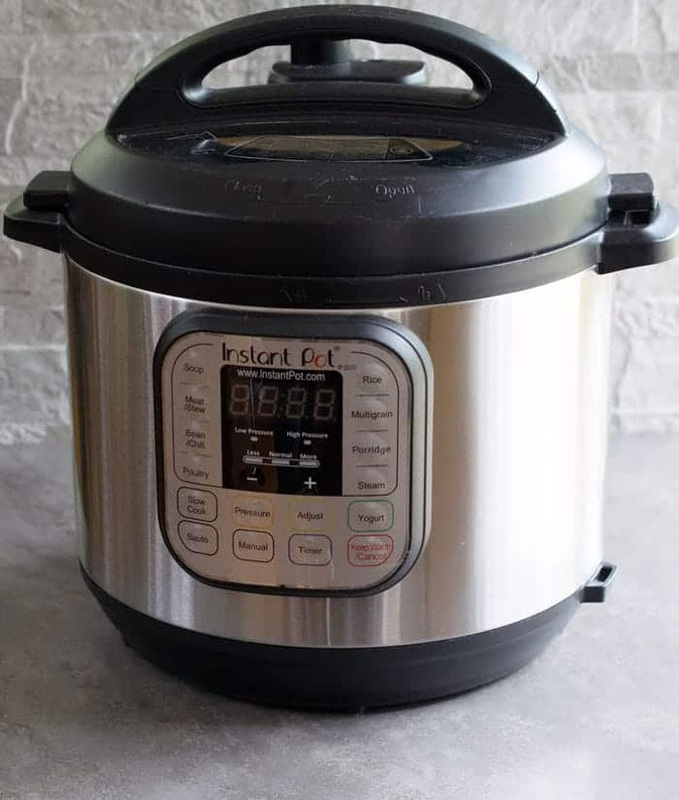 I thought about pressure cooking, but it might be more trouble than it's worth, with the getting up to pressure, cooling down, etc. My youngest daughter, Justine, gave me a challenge yesterday. 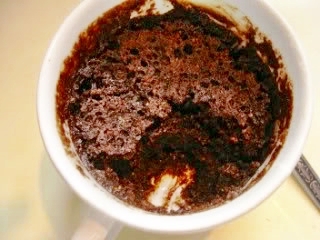 Devise a Weight Watcher-friendly, preferably vegan, 5-Minute Chocolate Mug Cake. I vaguely remembered hearing about this cake before, but hadn't looked into it. So, I set about meeting her challenge. I looked up various recipes and comments on the recipes, first of all. Then I set to work. I wanted it to be vegan, of course, no-fat (except for a very few chocolate chips), and whole grain, but also nicely chocolate-y and slightly gooey. We tried 2 of my versions last night-- one was too dry, so we didn't eat it! I was pretty happy with the other version, though. I ultimately made it in smaller servings than the original cake-- the larger size was too big for a healthy snack. To refine the recipe, I made the ultimate sacrifice and had the final version for breakfast this morning! I must say, I'm happy with it! I hope you like it, too! NOTE: The updated 2018 version below has a an easy GF AND low-glycemic option. Quick, 3 WW points, gooey and satisfying! The ultimate quick chocolate hit (well, maybe second to Drinking Chocolate!). The chocolate chips may sink to the bottom, but no worries-- that makes an “icing” on the bottom that you can scoop up with each bite of cake! 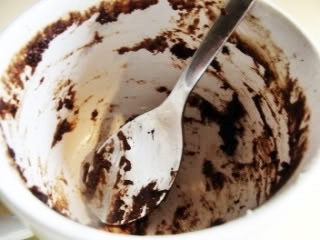 (BTW, I tried removing the cake from the mug to a plate, but it doesn’t look very attractive and dirties another dish, so better to eat it right out of the mug!) See Variations below for Gluten-Free version. 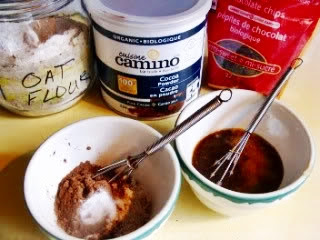 NOTE: One of my readers suggested quadrupling the dry ingredients and the brown sugar to make a quick mix-- great idea! (You could even multiply it further, I would think.) Measure out equal servings of the mix and bag them in little sandwich baggies. Maybe print out labels with the wet ingredients and stick them on the baggies. Lightly spray two 1-cup mugs (such as cappuccino mugs), or 1-cup ramekin s, with oil from a pump sprayer. In a small bowl mix together the Wet Mix ingredients well with a whisk. The ramekins in this picture are the right size to use for microwaving the cakes if you have no suitable mugs, BTW. Pour the Dry Mix into the Wet Mix and whisk together well. Divide the batter evenly between the 2 prepared mugs. Sprinkle 1/2 tablespoon chocolate chips over the batter. Cool on a rack for at least 5 minutes. Eat right out of the mug or ramekin! 1.) If you have no leftover coffee, you can add 1 /2 teaspoon coffee or espresso powder to the water, or just use water. 2.) Freeze unsweetened canned or homemade applesauce in ice cube trays and pop the cubes into zipper-lock bags-- each one is 2 tablespoons! You can thaw them quickly in the microwave. 3.) For oat flour, just whiz rolled oats or quick oats in a DRY blender to a fine flour. 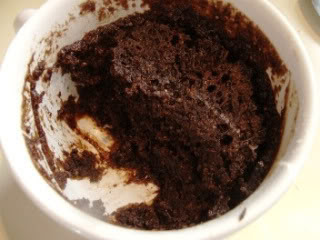 The directions in the main recipe above are for 2 servings—for 1 serving, you can mix the Wet Mix right in the mug or ramekin that you are going to microwave the cake in. Microwave 1 serving for only 40-50 seconds. I can't believe this week has gone by so fast! Sheesh! And here it is Thursday again! We did have a fun few days with DH's stepdaughter from Montreal and her two lovely 12-year-old twin daughters. We had a picnic the beach with some friends and 2 of my granddaughters, the girls having a great time swimming, canoeing, going out on my stepson's motor boat, and getting to know each other. We went to Salt Spring Island for a night, with the "gang" (as DH calls them) to visit more family-- driving in style in a friend's immaculate white 1972 Chevy Caprice. We would have been squished in our little car, with no air conditioning on the hottest weekend of the year, so our friend offered his ride. Very fun, and a big surprise for the Salt Spring relatives when we drove up! But, along with company, cooking, the ordinary daily running of a house and job, family, and, of course, the Book-- hours of editing-- it's been mostly work and very little serious cooking, I'm afraid! 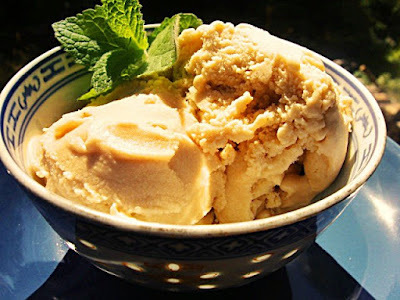 I did make an interesting recipe yesterday-- Lucuma ice cream (vegan, of course!). Lucuma is a Peruvian fruit and, as many of you may know, my father was Peruvian. I remember lucuma ice cream from my three months in Peru as a six-year-old. Lucuma is a fruit with a quite dry texture, so it isn't eaten as a fruit, per se. Mostly it is used for a delectable, rich ice cream. Lucuma is rather sweet and has a butterscotch-y sort of flavor. When I was in Vancouver last, I found a store with Peruvian foods and bought some frozen lucuma puree-- what a coup, I thought! Yesterday I worked out a recipe based on my vanilla gelato recipe made with Instant Clearjel®, with the help of a (non-vegan) recipe from the internet. After splattering the kitchen with soy cream after a little accident (Mercury is in retrograde-- what can I say? 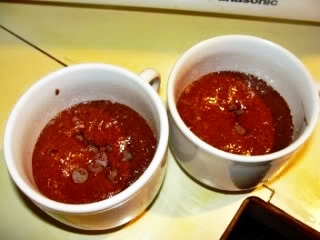 ), I made the mix and tasted it-- WAY too sweet!! I couldn't figure it out! My gelato is not as sweet as most, and I had used less sweetener than the non-vegan recipe called for (in relation to the volume of liquid, etc.). So, I got out my (new, under-used) reading glasses and read the small print on the bag of lucuma puree-- sugar! I had been assuming that it was unsweetened, since the label did not say "sweetened" and the recipes I found online all called for unsweetened puree. My mistake! I tried diluting it with more soymilk-- still overpoweringly sweet! (I now have about 2 quarts of very sweet milky liquid in the fridge that I have to think of some ways to use! Any ideas?) So, I started over and used no sweetener at all. It still tasted too sweet to me, but I know that when food is frozen, the sweetness is not as apparent, so there was hope. I stuck it in the freezer and hoped for the best, as I was hoping to take it to a family dinner with my sister and my mother on Friday-- they will remember this treat, too! BTW, lucuma is being called a "superfood", but I think this is somewhat of an exaggeration. It's true that it has lots of fiber and beta carotene, but, then, so do carrots! It is high in natural carbohydrates, so it was used by the Incas to provide energy, and evidently the trees are very prolific-- no wonder it was a popular food. Tasting sweet and butterscotch-y didn't hurt! I just feel that we should not go hog wild over exotic foods that are supposed to provide miraculous nutrients, when, in fact, we have foods at home that are just as good, more available, and much cheaper! For me, his is an exotic treat to relive some childhood memories. Anyway, that said, we tried a bit of the ice cream when I was photographing it and re-packing it, and it is delicious! Here is the recipe I used with the sweetened puree, but I plan to try it again with the lucuma powder and will report back! 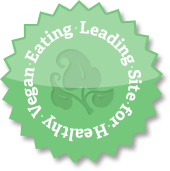 Update Aug. 2012: See a recipe for Vegan Lucuma Ice Cream using lucuma powder here. And stay tuned for Take 3! Place the creamer, milk, and lucuma puree into a blender along with the soaked, drained cashews, and blend until VERY smooth and frothy (make sure that it is not grainy at all). Chill the gelato mixture thoroughly, and then freeze according to directions for your ice cream machine. Scoop into a quart plastic container, cover and freeze for several hours (preferably 24 hours) before serving. A rather tippy veggie burger, with all the trimmings, made with one of my new thin buns. I've been meaning to try some "sandwich thin"-type buns for a long time, and finally got inspired to adapt one of my favorite burger bun recipes-- one I've used for over 25 years! The recipe was an old "yeast batter bread" recipe. In those days, you made a yeast-leavened batter and just rose it for 30 minutes, then formed the bread or buns, rose again briefly and baked. These were tasty enough, but I figured that they could be improved upon by using the newer no-knead bread techniques. 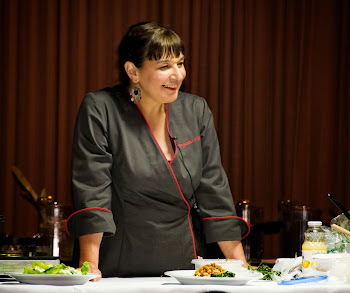 The longer rising time with the new techniques develop the gluten and the flavor. I chose this recipe because it was 100% whole wheat, vegan already (many sandwich bun recipes contain egg), it was "tried and true", and it is fairly soft (due to the added potato). It worked very well, though some might say they aren't big enough for some burgers. I added an option to make bigger buns, if you like. But these just fit the burgers I had around and I thought it was great that the bun didn't overwhelm the other tastes. The bun was soft, but held together well and didn't get soggy. I did a little research, and whole wheat burger buns seem to range from 110 calories to 210 calories. Mine are 98 calories for the smaller ones and 130 for the larger ones. If you want to raise the fiber level, you can add 1/4 cup of wheat bran to the batter with no ill effects. At any rate, you can control the ingredients, and they certainly are easy and cheap to make! My freezer is now sticked with burger buns for quick meals! These are half the calories of many ordinary sandwich buns, 100% whole grain, and 1.5 ww points! Also, very good! Dissolve the yeast in the water. Add to the soymilk in a medium bowl, along with the potato flakes, oil, syrup or sugar, and salt. Add the flour and ground flax and stir with a heavy wooden spoon or Danish dough whisk until well mixed, but rough looking. Cover and let rise at room temperature for 2 to 18 hours. Then refrigerate the dough, well-covered, for at least 3 hours and up to a week. Carefully transfer to baking sheets lined with baking parchment and sprinkled with flour or cornmeal. The rounds should have a little room around them, unless you like them softer, in which case you can have them barely touching. Note: You could also use a hamburger bun pan, either with 3 1/4” molds (for 24 buns ) or 4 1/4” molds (for 18 buns). Pat down the dough in the center of each round, so that they don't make big "humps" in the middle when they rise. Sprinkle the rounds lightly with flour, cover with plastic wrap, or place the pans inside of large food-safe plastic bags,and let rise 40 minutes, while you heat the oven to 375 degrees F.
Brush the buns with nondairy milk and sprinkle with sesame seeds or other topping. Bake 15-20 minutes, or until golden. Cool on racks. When serving, slice them in half horizontally with a sharp serrated knife. Nutrition (per serving [1 of 24 buns]): 98.3 calories; 19% calories from fat; 2.2g total fat; 0.0mg cholesterol; 169.2mg sodium; 131.7mg potassium; 17.3g carbohydrates; 3.1g fiber; 1.7g sugar; 14.3g net carbs; 3.8g protein; 1.5 points. If you make 18 larger buns (4" across) the nutrition facts are as follows: Nutrition (per serving [1 of 18 buns])): 131.0 calories; 19% calories from fat; 2.9g total fat; 0.0mg cholesterol; 225.6mg sodium; 175.6mg potassium; 23.1g carbohydrates; 4.1g fiber; 2.2g sugar; 19.0g net carbs; 5.0gprotein; 2.1 points.